If using salted fish rinse under running water to remove all salt crystals. Warm the Maa’s Tomato Sauce in a saucepan. Add the chopped bacon and leave to cook on a low simmer for about 10-15 minutes. Pour in the black-eye beans, give it a good stir, add the fish, cover and simmer for roughly 45 minutes to an hour, stirring occasionally, until the beans are tender. 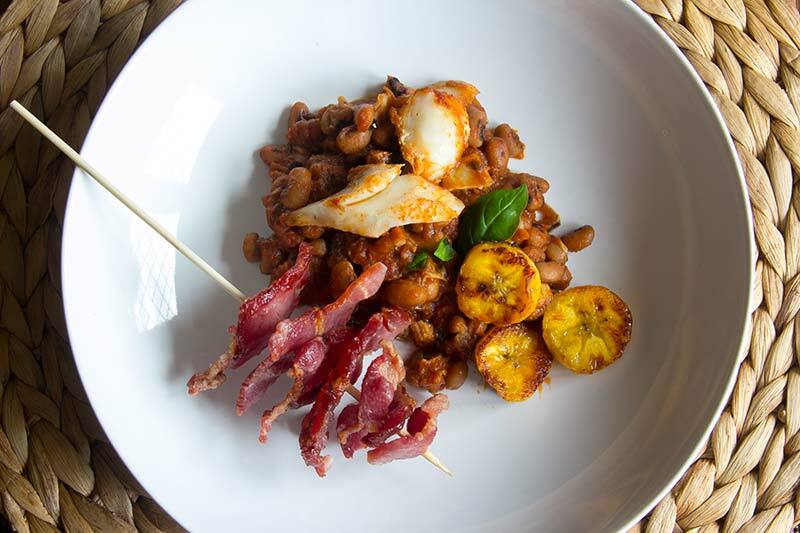 Serve with fried plantain, plantain fritters, boiled rice, gari, or as a topping for a jacket potato. If using tinned beans, squeeze a few beans between your thumb and forefinger to make sure they are soft. If not, before step (1), simmer with ½ tsp of bicarbonate of soda until tender. If, like me, you prefer dried rather than tinned beans you will need to pre-soak and pre-cook until just tender before starting step (1). No Replies to "Black-eye Beans with Smoked Fish & Bacon"